Fiction – paperback; Faber and Faber; 127 pages; 2008. Translated from the French by Shaun Whiteside. When it comes to satire and parody, reality television seems ripe for the picking. I’m not a fan of Ben Elton but I read his very funny and clever send-up of Big Brother, entitled Dead Famous, back in 2002 when the genre was rather new and exciting, if a little tasteless. But now, six years down the track, reality television is everywhere. Although the popularity of Big Brother is on the wane (according to this year’s viewing figures the ninth series of the British version of Big Brother was apparently the most unpopular series since it started), our TV screens are still filled with endless variations of this rubbish: I’m a Celebrity Get Me Out of Here, Strictly Come Dancing, the X Factor, Wife Swap et cetera, et cetera. How refreshing, then, to find a book that looks at reality television and poses the question, what if we created a show that was so utterly tasteless and so morally outrageous, would anyone watch it? Belgian author Amélie Nothomb seems to think the answer is yes. 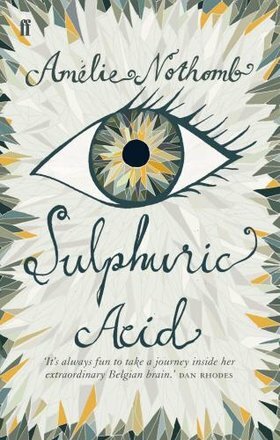 In her intriguingly titled Sulphuric Acid, first published in 2005, she creates a reality television show like no other in which Parisians are rounded up on the street, thrown into cattle trucks and taken to a TV studio that has been set up to look like a concentration camp. Here, contestants are forced to live like prisoners, deprived of food and basic human necessities, under the watchful eye of the TV cameras. A select few are elevated to the position of kapo (guard) and are encouraged to be aggressive and mean to the prisoners under their “care”. The show, which is called Concentration, is obviously immoral but the ratings are sky high and viewers are hooked on the dynamic between one of the prisoners, the beautiful Pannonique — otherwise known as CKZ 114 — and her guard, the despised Zdena, who regularly beats her. At times the book is almost too horrific to read. It exposes the ease with which people can turn against their fellow human beings, treating them with brutality and contempt as if their lives were totally worthless. But the book also shows the capacity for human suffering and it is perhaps this aspect I found so chilling. Nothcomb uses this fable to have a pop at the media, too, but ultimately she reserves her most damning judgment for the viewing public. Concentration won the total audience: one hundred per cent of the population. The programme was watched by everyone, literally. Blind people, deaf people, priests, nuns, anchorites, street poets, children, newlyweds, pets — even the rival channels had interrupted their schedules so that their presenters could watch. This is a blackly funny and provocative read, one that makes no bones about condemning our obsession with reality television and the celebrities it creates. It’s ultimately very shocking, and some may find it too twisted, too dark, for their liking. Still, it’s hard not to admire an author who, in just 127 pages, is capable of packing such a powerhouse punch using nothing more than elegant, bare-boned prose and a strong moral compass. Yes, people would watch a show like this. In fact, in the US, reality shows are the most popoular TV format. I watch a couple, but mine are higher brow ones (Project Runway and Top Design). I don’t think that I will watch the next season of Million Dollar Listing – boring people. Isabel, scary, isn’t it? The book proposes a world that is incredibly immoral, but also very close to the bone. I’ve heard mention of Project Runway but it’s not screened here in the UK. Not heard of Top Design, or Million Dollar Listing. Interestingly enough, American content is kept to a minimum here, whereas when I lived in Australia American content dominated the TV.